The foods I most remember — the ones that grip me tightly somewhere between my heart and stomach — are the ones I enjoyed in my great-aunt’s 19th-century duplex in New Haven, Conn. She shared the house with my grandfather Lou, and that was where our family gathered to celebrate special occasions and holidays, and to savor the meals I would forever associate with feelings of comfort, warmth and, later, longing. It was in her tiny kitchen with its yellow linoleum floor and temperamental oven that I ate my first solid food: a meatball. 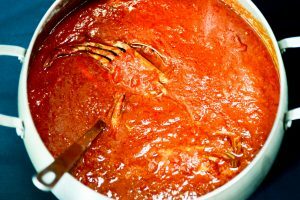 My favorite food, though, was her blue crab sauce, a simple yet extraordinary dish that I make year-round, to this day.